Thank you for your interest in One Aldwych Hotel! We hope you will be as excited as we are about the transformation and look forward to welcoming you back for more great events in 2019. One Aldwych is an award-winning contemporary luxury hotel, with five versatile spaces for meetings and private dining. Ideally located in the heart of Covent Garden, the cultural centre of London, the hotel is within a 10-minute walk from the Royal Opera House and over 25 theatres, providing endless possibilities for extraordinary events and group stays. 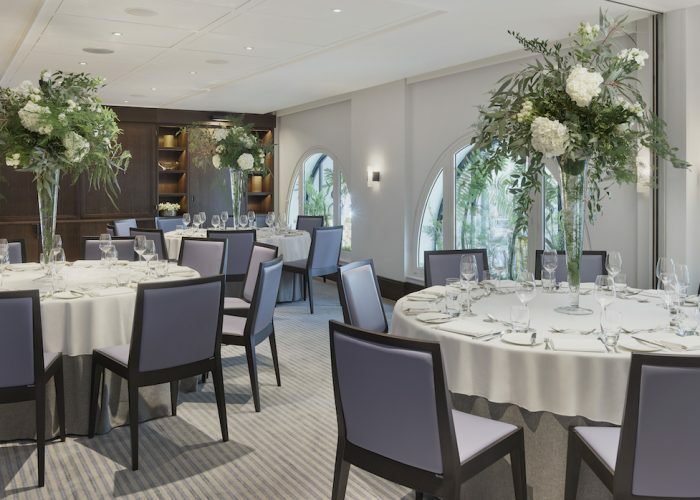 Whether you are planning an intimate dinner, a Champagne reception for up to 80 or a business meeting, One Aldwych offers an ideal space for every event. Our private rooms feature natural daylight, original artwork, state-of-the-art technology and complimentary WIFI. Executive Chef Dominic Teague and the Indigo team have created a selection of delicious menus, including exceptional breakfasts and business lunches, three and five-course feasts and la carte dining options. Whilst Eneko Basque Kitchen & Bar, in partnership with the three-Michelin starred Chef Eneko Atxa, showcases a modern take on traditional Basque food from northern Spain, offering playful dishes and decadent desserts in a relaxed setting. With its own private entrance, guests will arrive down the grand copper staircase descending into the bar to enjoy a carefully crafted all-Spanish wine list, including a selection from Eneko’s family winery, Gorka Izagirre. Our wonderfully creative in-house florist Mark Siredzuk can create beautiful displays and arrangements to add the finishing touches. Speak to our events team today to discuss your event and your requirements.